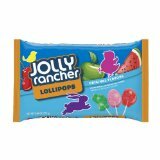 Jolly rancher Easter lollipops in the shape of Easter Eggs, bunnies and chicks. You get 3 different flavors of suckers green apple, watermelon and cherry. Each bag as approx 20 suckers. These are perfect Easter basket candy.